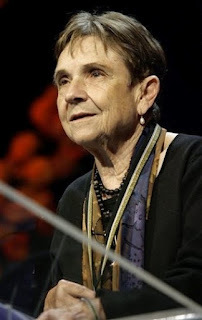 Adrienne Rich died this last week. Reading various articles about her, it struck me how we label people - she was an American, feminist, lesbian poet and writer. She was once married and had three children - all boys. She was Jewish by patrilineal descent, but claimed her Jewishness, and living in a liberal, intellectual society, was accepted as Jewish by those around her - even her more Orthodox, but quite secular, in-laws. I first came across her during a unit of Women's Studies at Flinders University nearly ten years ago. I had an idea for a post grad research thesis and needed to clock up some legitimate time in Women's Studies as it was going to in multi-disciplinary supervision. While I'd written art history papers from a feminist perspective for years, it was the first time I'd tackled general literature within this kind of framework, and it was an exhilarating and, sometimes, scary year. It's where I met Virginia Woolf's A Room of One's Own, which I'm still wandering through in odd moments - enjoying it all the more for not having to write about it academically at the end! When I heard that Rich had died, I got my anthology off the shelf and it fell open to that poem. There are other pages marked in the book, but that's the one it fell open to... In the interim, since then, I've had cause to ask myself those questions, and continue to ask them, such is the resonance they had for me. In her essay Split at the Root, she explores the nature of her mixed heritage, the pull Judasim has for her, her sense of her Jewishness regardless of what halachah would determine as her Jewish status, her struggle with what she calls her own anti-semitism coupled with her ignorance of much of what constitutes being Jewish. It is objective, insightful, humourous at times, and - in its sense of struggle - honest.